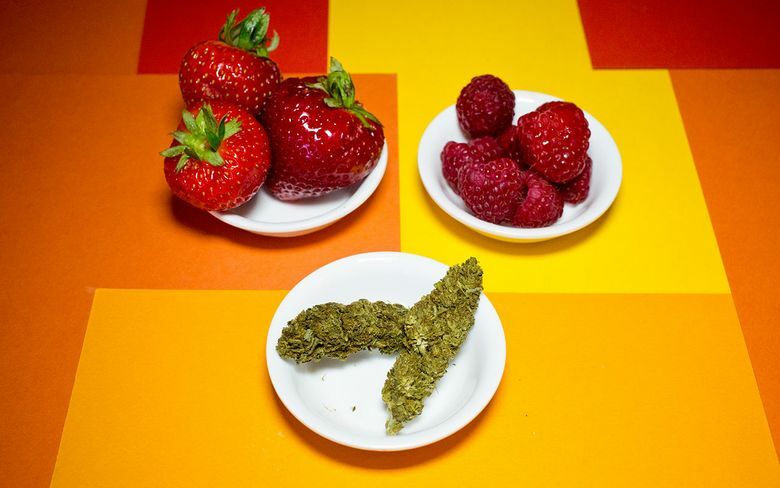 Cannabis fruit leathers are sweet, tart and chewy. So many people make their own snacks, and I have tried more and more to be one of those people (when I can muster the energy). It’s lots of work, but if you are trying to get to know a recipe, there’s nothing better than repeating it on a weekly basis. This will help you work out all angles of its mysteries and create your own tweaks that make it perfect (to you), while hopefully saving you some money. Fruit snacks and fruity snacks are such a joy that no one ever really grows out of them, if they had to be honest. Chewy, sweet, tart and glucose spiking make these perfect for snacking, and adding cannabis gives you the taste of novelty while you medicate. Take this simple recipe inspired by countless mom bloggers and one of my favorite internet chefs to the spacey zone with a good dram of cannabis. Adapted from Claire Lower, Lifehacker.com. Rinse fruit and allow to dry. Remove stems and leaves from strawberries and quarter. Place all the berries in a pot with the sugar and lemon juice. Bring to a boil and lower to simmer, stirring occasionally. Simmer for 15 minutes until it’s reduced a bit. Add the gelatin packet while stirring to make sure it doesn’t cause any lumps. Preheat oven to 150 degrees. Remove fruit from heat and allow to cool slightly, then add the glycerin tincture and stir one last time. Pour over two baking sheets lined with parchment or Silpats. Smear into a uniform layer, and pop into the waiting warm oven for an hour. Take out and allow to cool completely before cutting into slices. Roll each slice up in strips of parchment paper and decide how long you want the shelf life. They will last two to three days on the counter in an airtight container, one week in the fridge, or one year in the freezer, and they defrost very quickly while staying chewy. Try out a variety of fruits and make your own combos! Tart berries are my fave and really work well with the cannabis notes in the tincture. The chewy strips are easy to cut to adjust dosage or to share, and you can chow down on the whole strip (or three) thanks to the low dose. Decarboxylate 3.5 grams of finely ground cannabis at 225 degrees for 20 minutes in a tightly sealed, oven-safe container. Put cannabis in lidded mason jar or vacuum-sealed bag with cannabis and ½ cup vegetable glycerin. Heat in water bath just under boiling for at least 1 hour. Strain and chill to use in recipes.